There are wayy too many new things coming out in the wedding space - especially wedding photography! 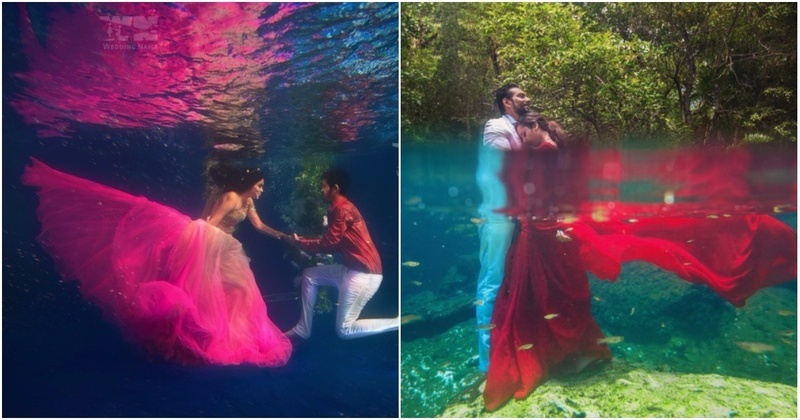 One of the coolest ones we’ve been seeing is the underwater wedding trend. Yes, that’s right. Water babies, unite! When we even have phones that are so waterproof that you can take them diving, an entire wedding shoot can easily be done - with the right gadgets and skill, of course. We’ve even got whole weddings taking place in the water! While a whole wedding in the water might simply be is definitely too cumbersome (unless you’re as dedicated as this couple) , pre-wedding / post-wedding shoots or proposals are totally doable! They’re certainly something different. You can even have a group picture with the wedding squad! If you’re not sure about anything underwater, no problem! Just have a floating mandap, like this one. You even get to decorate it beautifully! And what about this stunning mehndi shot? This is something I’d want! And this shot of the wedding rings. Definitely doable. If you want your own underwater wedding shoot, let your photographer know before hand (duh). So would you try this? Do let us know if you do!